What do I need to bring to an instruction or guiding session? What flies should I buy or tie? The Weir Pool is especially suited to beginners. It is relatively wide and free from overhanging vegetation. I hope you enjoy the Upper Yealm Fishery and that you encounter the wildlife, some common and some rarely seen. Over 50 years ago when the pace of life was much slower, the writer Dermot Wilson commented â€œIn the West Country you can catch trout from after breakfast till sunset, and enjoy the open air and the country for as long as the sun is in the sky"
Devon is still blessed with mile after mile of superb fishing for wild brown trout, sea trout and salmon. A fly fishing guide can unlock the secrets of catching these wild fish in unspoilt surroundings. Many of the beats we use have benefited from work carried out by the Westcountry Rivers Trust to improve access for anglers. A guide can help you read a river and understand why some parts of the river are more likely to hold larger fish. Westcountry trout are generally not fussy eaters but sometimes the size of the fly does matter. Being able to recognize the insects that live on stones on the bed of the rivers will give you confidence that you are using the right type of fly. A roll cast is often the best way of delivering a fly when you are faced with overhanging bankside vegetation. We can help you refine your casting techniques. If you understand what triggers a trout to take a natural fly then you will be able to choose an artificial fly with greater confidence. A guide will explain how a trout manages to intercept a tiny morsel of food being carried by the current down a fast flowing river. This will help you present your fly more effectively. We can help you plan your trip by offering advice on where to stay and suggesting places to eat after a day on the river. You probably prefer to use your own equipment. But if you want, we can lend you a rod, reel and line and supply flies and tippet material at no extra cost. Please bring your Environment Agency rod licence. We can supply you with Westcountry Angling Passport permit tokens. "As a fishing guide myself I am well aware of the advantages of getting some local knowledge to kick start things and I was not in the least disappointed to have Geoff with me on my first forays. In fact without his assistance I doubt that I would have found the best parts of the river or been confident enough that I was using the right tactics. If you have yet to sample these streams, and I strongly suggest that you do, then you can contact Geoff or his partner Paul Kenyon. Fishing guides do it because we love to help other anglers get the most of their time on the water. Geoff definitely fits into that category." This video contains tips on using sea trout behaviour, shape and colour to spot these very shy fish. "I thought Paul was joking when we started a Monty Pythonesque, slow walk from the middle of the field. The river wasn’t even in sight at that point, but the Sea Trout are so spooky that one has to proceed with extreme caution. In the end we spotted a few, fascinating things they are, and tricky to see, they barely move, trying to hang on to reserves of energy that they will need to reach the spawning grounds when the rain comes. Fish in a river are tricky to spot at the best of times. Fish that don’t move are near impossible and Paul’s eagle eyes and experience revealed fish that took me minutes to locate." Learning how to cast a fly can be difficult because you canâ€™t watch yourself while you cast to see what youâ€™re doing right or doing wrong. The best solution is to spend a few hours with a qualified game angling instructor. We recommend beginners take their first lesson on a stocked stillwater that gives you an opportunity to catch a fish on a fly. We will teach you how to perform roll and overhead casts and shoot line to achieve distance. We can also teach you how to single and double haul to deal with awkward winds and cope with those â€œjust out of reachâ€ fish. We will introduce you to some of the bugs that make up a troutâ€™s diet. And how to select a fly to â€œmatch the hatchâ€. We are often asked for advice on what flies to use on local rivers. This is a perfectly understandable request. Even as guides we suffer agonies of uncertainty about what flies to take when we go on holiday to unfamiliar rivers. Westcountry trout are generally not fussy eaters but sometimes the design of fly does matter. Being able to recognize insects that live on stones on the bed of the rivers and stages in their life-cycle will give you confidence that you are using the right type of fly. If you prefer to buy a collection of suitable flies we recommend a visit to local firm Snowbee's retail outlet where you will find an impressive stock of suitable flies for local rivers. These flies are tyed by North Devon firm Tyrell England's longest established company of fly dressers. Here is a selection of fly-tying videos for productive flies on local rivers. As far as possible I have included videos made by the person most often associated with the particular fly. I have included improvements / variations on the original tying, particularly if made by the original tyer. If you tie your own flies, you may also find it useful to get hold of a copy of Peter Gathercole's book "The Fly Tying Bible". Another useful book is Max Fielding's "The Complete Fisherman's Fly". Paul lives in Ivybridge on the southern edge of Dartmoor about 6 miles from the Upper Yealm Fishery. Paul devotes more time than is reasonable to his lifelong love of all things associated with fish, fishing and Dartmoor rivers. Geoff lives in Chagford half a mile from the river Teign and within easy distance of the Dartmoor lakes and streams. Geoff's favourite fishing is for brown trout in the wilds of Dartmoor. We instruct and guide because it gives us great satisfaction when a beginner presents a delicate cast, or an experienced angler admires the colour on one of Dartmoor's wild brown trout. But it should never get too serious. "Paul and Geoff were generous with their time and hospitality, they know these rivers and the fish that inhabit them better than anyone and if you wish to fish this area you are well advised to be in touch with them for some hands on advice and guiding." A Fly Fishing Devon Gift Voucher makes a great Christmas, birthday, surprise present or way to say "thank you" at any time of the year. The Gift Voucher can be designed to cover the needs of beginners as well as more experienced anglers. We provide all the equipment: rod, reel, line etc. for the recipient. 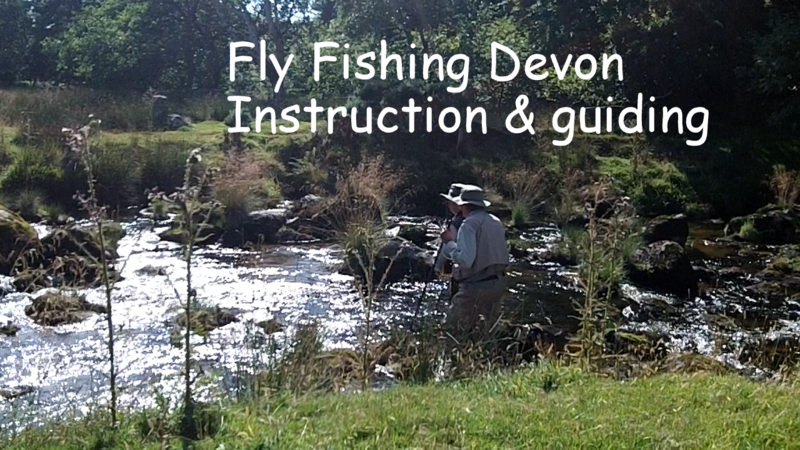 Please ask the recipient to 'phone or email Fly Fishing Devon to arrange a suitable date and location and tailor a session to meet the needs of the person receiving the Gift Voucher. Prices for instruction and guiding include use of equipment but not the cost of a fishing permit and rod licence. The cost of a fishing permit ranges from £10 to £25. Westcountry Angling Passport Tokens are available online or through WRT local agents. Children under 12 do not require an Envoironment Agency rod licence. A day's Environment Agency (EA) rod licence costs £6 for non-migratory trout. EA licences can be purchased online , from any Post Office, or The Telesales Service on 0870 1662 662. As well as instructing and guiding, we do a lot of fishing, and reflection about fishing. Several of these articles introduce the techniques and approaches we find useful for catching wild brown trout on west country rivers. Roll casting: "Small Stream Skagit Casting"
What fly rod, reel, line should I buy? How does a trout catch a fly? Why does a trout miss a fly?